My First Trip Down the Massive City Museum Slide! Enjoying First-Time Experiences is Reason for Major Thanks! There is a rush that comes with doing things for the first time that you simply cannot recreate. Whether it comes from riding a bike without training wheels, or taking your first solo trip outside your home country, there are things that you notice, things you appreciate on a first-time experience, that can help shape your world view. This weekend I got to witness and participate in a few of those as my sister brought my niece and a friend to visit. They arrived into St. Louis and we met up at the St. Louis Zoo! It’s a great zoo, one of the nation’s most popular and I have previous written about it as a top St. Louis family attraction. 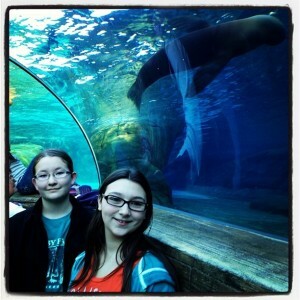 It was my guests first time to see the new sea lion exhibit and we really enjoyed it. That’s a really small first, but it was a fun one. We also went to the Gateway Arch and the City Museum (my other 2 fave family adventures!) this weekend for some other firsts for our friend V. And seeing the girls climb the cages stories high from us was a first for me too. And we all played on slides, climbing up in various areas. But I have to say, that before we left the City Museum I also had a first time experience! That was going down the massive slides! Seriously! The slides go the full 10 stories! Can you imagine? This is a photo looking up from the bottom. As you can see, it is really dark in there so the pic is fuzzy but the memories are crystal clear! When we were at the top, I was thinking practically. Where should I put my camera to make sure I can keep it protected on the spinning ride down. Then as I went, I was wondering whether I needed to position my body differently to gain speed or slow down depending on how fast I was going! It was exhilarating! 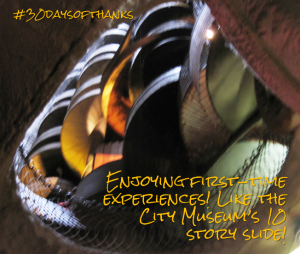 I highly recommend the City Museum Slide! The rush was very real and I have to admit that we all were enjoying it! But it also leaves you a little disoriented when you finish! You started so far above and then next thing you know, you are in a cave! Granted I had been in the cave before, but the sensation of coming down the slides was all new! 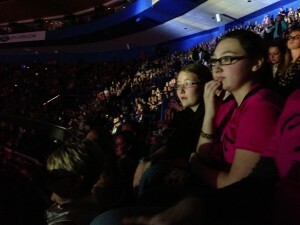 Then Monday night there was another first… it was the first time the girls had been to a concert! We took them to see Pink! 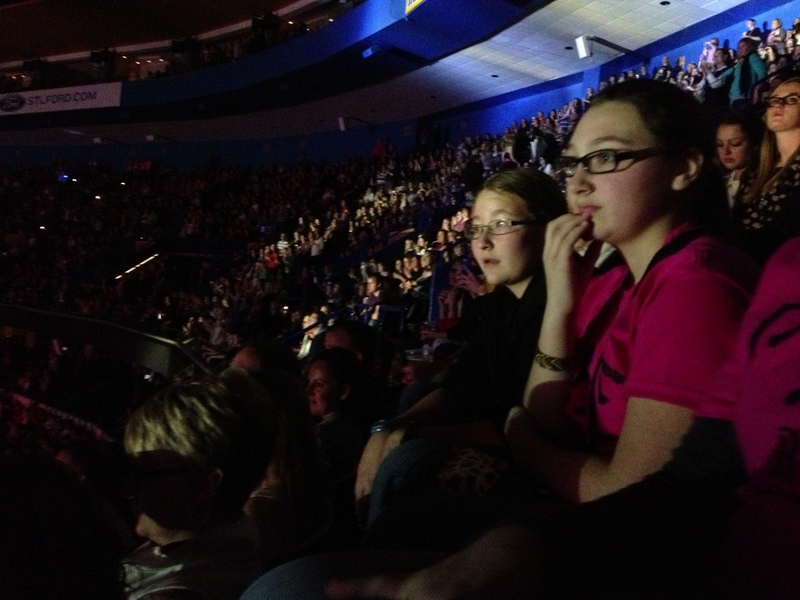 Yes, Leslie & I saw Pink in concert in Nashville in March but the girls…. well, seeing them take in such an extravagant stage production… that was really special. I mean, just look at their faces! They were entranced! That lasted for a song or two and then the clapping, the singing at the top of their lungs and a bit of dancing started. I was certainly encouraging said behavior! It was fantastic to see them taking it all in, to hear their questions, the reactions to things…. to be there when they had a big first-time experience! What’s something you have done recently for the first-time? Or did you get to see someone else enjoy something for the first time & get a rush from that? « Fresh Air on a Beautiful Day! Can I Get a Big THANK YOU! No 10 story slide for me! But I have a brave child that would try that so we can come visit you. 🙂 I went on a cruise for the first time this year. I LOVED it and will do another one again soon. Thanks for the mention to the 30 Days series on my blog! Oh, I can be a sissy about a lot of things myself and there were things that day I didn’t even consider trying but the curly cue slide…. that was fun! Interesting with the cruise. I’ve never gone on one and I really love travel but haven’t really wanted to do a big cruise but I really thought about doing a smaller one of the Mediterranean at one point. It sounds like a really exciting group of first time experiences! So glad you had fun.